This article will explain how to configure a bootable NVIDIA RAID arrary on an nForce based motherboard which supports the NVIDIA NVRAID. You will need a blank 1.44MB floppy disk to create an F6 install floppy with the NVIDIA RAID drivers used during the installation of Windows XP or Windows XP 64-bit Edition. Download the driver to your PC. Once the driver has completely downloaded to your computer, run the file by double-clicking on the file. The default location is fine. Pleaese remember this location as you will need to browse to this location after the next step. Proceed by clicking on the "Next"button. The files will be extracted to the location given. Once the files have been extracted, cancel the rest of the Installshield installation process as you do not want to install the nForce drivers. Copy these files to your floppy disk. Your floppy disk now has the necessary files needed to begin the Microsoft Windows installation on your nForce system. Once you have downloaded the drivers, unzip the file. Copy the extracted driver files to your floppy disk. This will be used later during the installation of Windows. Please proceed now to your nForce based computer to configure the RAID array. The next steps will guide you with setting up a RAID array through the motherboard's BIOS and NVRAID BIOS. 1. Start your computer and enter the motherboard BIOS. 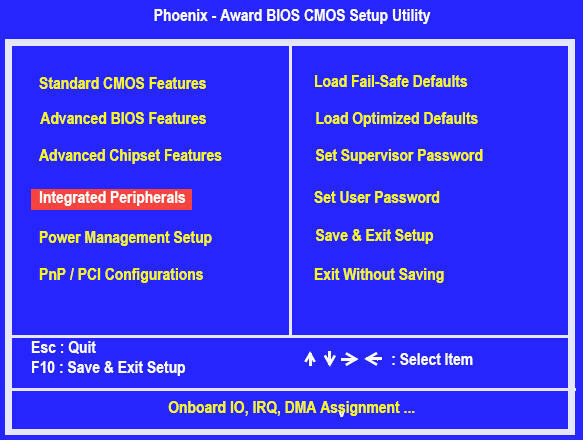 Most motherboards require you to press the "Delete" key on your keyboard in order to enter the BIOS. If your motherboard is different, then you will need to consult with your motherboard manufacturer for instructions on how to enter the BIOS. 2. Use the arrow keys to select Integrated Peripherals and then press the Enter key on your keyboard. The Integrated Peripherals screen should appear similar to the screenshot below. 5. From the RAID Config window, globally enable RAID, then enable the SATA ports with the disks that you want to use for RAID. port can only be used for non-RAID applications. 6. Press F10 to save the configuration and exit (your motherboard may have different instructions for saving and exiting the BIOS). Your PC should reboot. NVIDIA RAID BIOS as described in the next section. The NVIDIA RAID BIOS set up lets you choose the RAID type and which hard drives you want to make part of the array. 1 Wait until you see the RAID software prompting you to press F10. The RAID prompt appears as part of the system POST and boot process prior to loading of the OS. You have a few seconds to press F10 before the screen disappears. 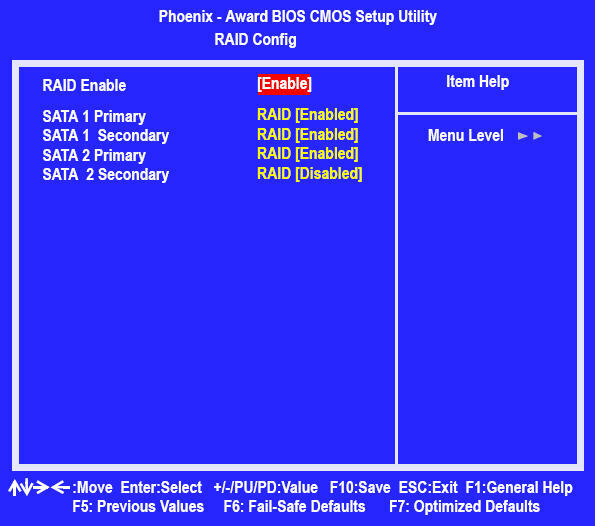 The disks that you enabled from the RAID Config BIOS setup page appear in the Free Disks block. These are the drives that are available for use as RAID array disks. 1. Tab to the Free Disks section. 2. 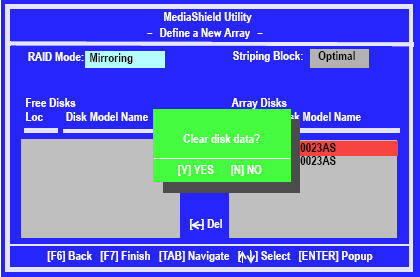 Move it from the Free Disks block to the Array Disks block by pressing the rightarrow key. The first disk in the list is moved, and the next disk in the list is selected and ready to be moved. 3. 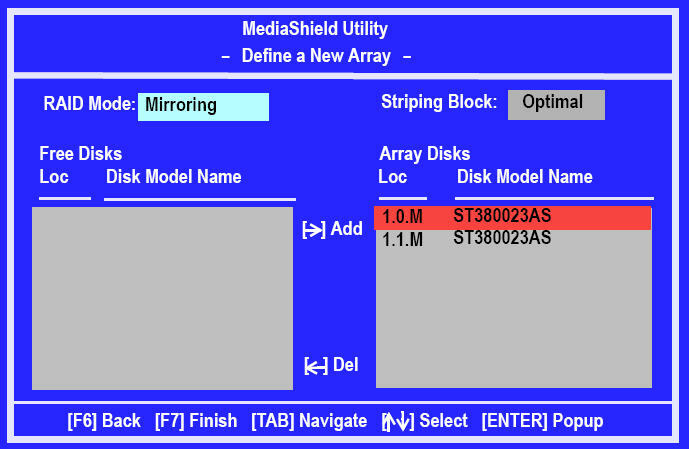 Continue pressing the right-arrow key until all the disks that you want to use as RAID array disks appear in the Array Disks block. 1. After assigning your RAID array disks, press F7. 2. Press Y to clear the disk data. 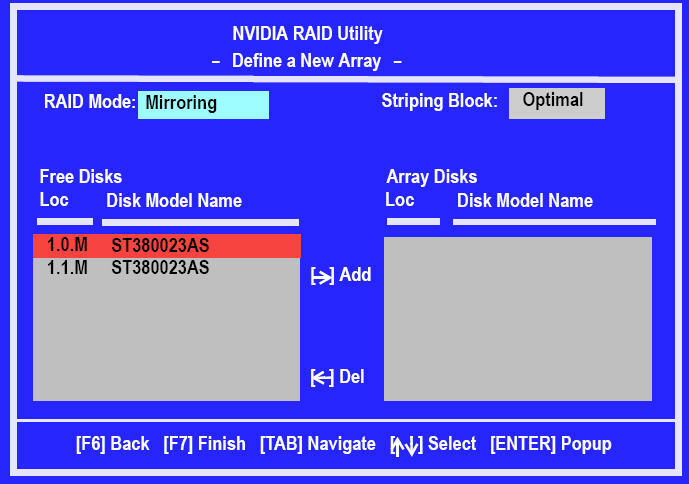 The Array List screen appears, where you can review the RAID arrays that you have set up. 3. Use the arrow keys to select the array that you want to set up, then press B to specify the array as bootable. 4. Press Enter to view and verify details. 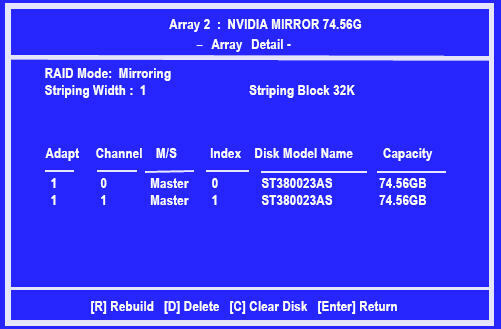 The Array Detail screen shows various information about the array that you selected, such as Striping Block used, RAID Mode, Striping Width, Disk Model Name and disk capacity. 5. If you want to mark this disk as empty and wipe out all its contents, press C.
6. At the prompt, press Y to wipe out all the data, otherwise press N.
7. Press Enter again to go back to the previous screen and then press F10 to exit the RAID setup. Your PC should restart. 1. Insert your Windows XP or Windows XP 64-bit Edition installation CD to proceed with the installation of your operating system. 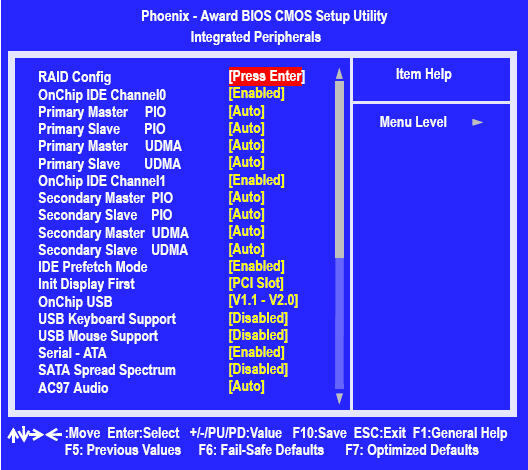 Make sure your CD ROM/DVD ROM is bootable from your motherboards BIOS to boot off of the Windows installation CD. The Windows Setup program starts. 2. When prompted by Windows, press F6 and wait a few moments for the Windows Setup screen to appear. 3. Windows does not include NVRAID drivers for your RAID controller on the Windows installation CD. 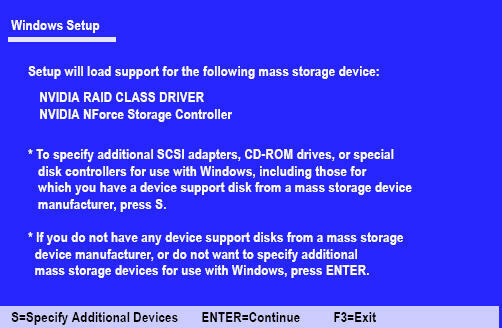 From the Windows Setup screen, insert the F6 install floppy disk with the NVIDIA RAID drivers which you created earlier. To specify the NVIDIA drivers, press S and then press Enter. 5. Press S again at the Specify Devices screen, then press Enter. 6. 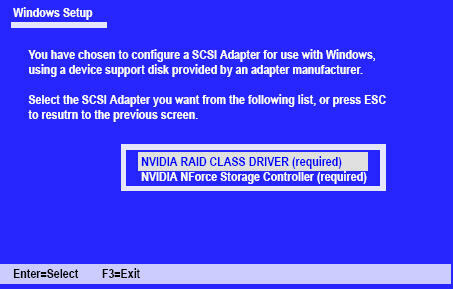 Select "NVIDIA NForce Storage Controller (required)" and then press Enter. 7. Press Enter to continue with Windows XP or Windows XP 64-bit Edition installation. 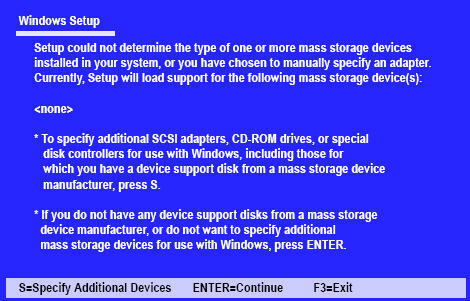 Be sure to leave the floppy disk inserted in the floppy drive until the blue screen portion of Windows installation is completed. When Windows prompts you to remove all disks, you may then take out the floppy disk. 8. Follow the instructions on how to install Windows XP. 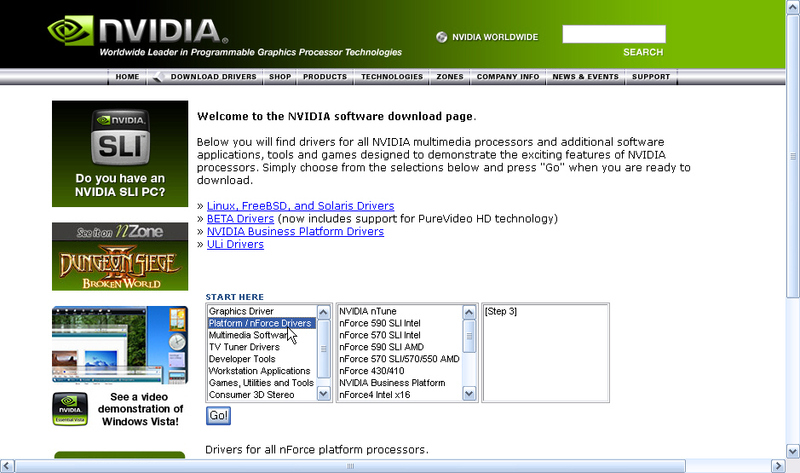 After Windows XP is completely installed, proceed to install the nForce driver package which you previously downloaded from NVIDIA.com. This will not only add drivers for your other nForce components but also the MediaShield application to allow you to access and troubleshoot your RAID array from wthin Microsoft Windows.